PROTECTION - against the complete spectrum of daily environmental challenges UVB, UVA, Infrared­‐A (IR-A) and visible light. Uniquely SPF50+ and broad spectrum UVB|UVA protection is combined with the Heliocare® 360° BioShield System of Fractional Biomimetic Melanin and Pro­‐Taurine providing additional advanced biological protection against high energy visible light and Infrared‐A radiation. The BioShield System absorbs high‐energy visible light at the skin’s surface and helps neutralise the action of infrared- A within the skin. Heliocare 360ᴼ airgel is a highly innovative ultra‐light, rapidly absorbed gel that is delivered as a gentle foaming mousse, suitable for all skin types. It is non­‐comedogenic, paraben free and dermatologically tested. Delivered from a sleek and cool aerosol, the gentle mousse is easy to apply and achieves an even uniform soft cover. 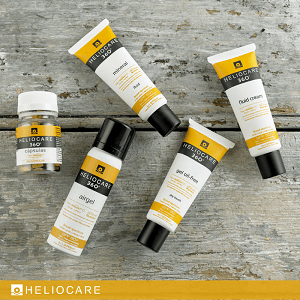 Heliocare 360ᴼ airgel is ideal for daily morning where a lightly hydrating product is required.